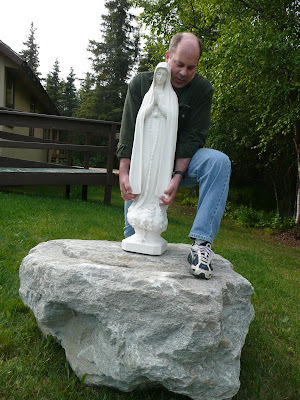 At Holy Rosary we decided we needed something to reveal our Catholic identity, like a statue of Mary centered on a huge rock. We love the church building at Holy Rosary. It is simple, beautiful, and spiritual. What we don't like about it is that although it looks like a church, it is hard to determine whether or not it is a Catholic Church. One of the ways we know it is a church is by a small three-foot cross on the building's roof. Note in the picture it is barely visible. The first thing we want people to know as they drive or walk through our parking lot is that our church is a Catholic Church. Hundreds of people drive through the parking lot to pump their containers full of clean, pure water. 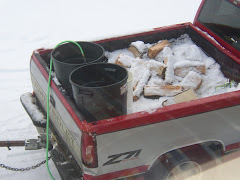 We have the coldest and purest water in town! 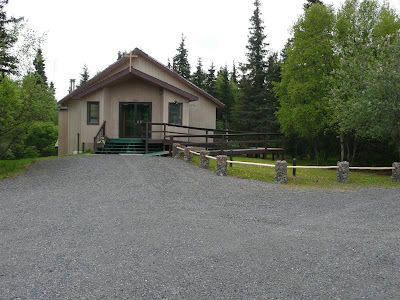 Also, there is a large influx of fishermen and hunters who drift through the Holy Rossary parking lot during the summer and fall. 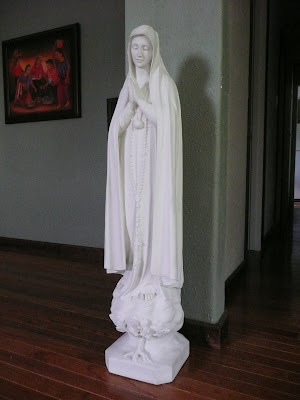 A statue of Mary would definately make our church look Catholic. We decided to order a reconstructed 140 pound marble statue from Italy. We wanted it to be a statue that represented Holy Rosary. Fr. Endal, back in the 1940's, named our church after Our Lady of the Rosary of Fatima. So, we purchased that statue. Jesus said to Peter, "On this rock I shall build my Church." 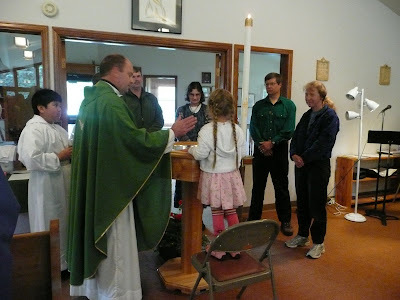 A rock is very old and long lasting like our 2008 year Catholic tradition. What a coincidence, the rock weighs a little over 2008 pounds, one pound for each year of our tradition. Also, a rock represents something solid, as in "solid in your faith." 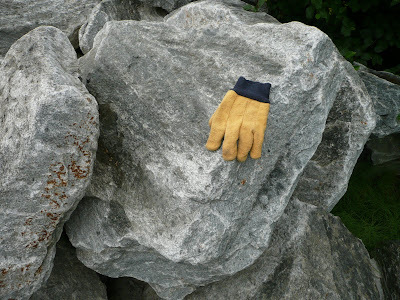 Rocks are simple, strong, and durable, which are all Christian ideals. Rocks are not perfectly round. And do you know what, we are not perfect either, neither was Saint Peter and all the apostles. 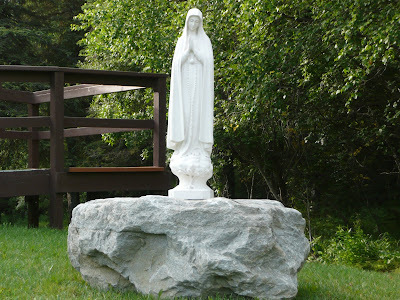 So, putting Our Lady of Fatima together with the 2000 pound Nome rock (which actually is the color of the cloud that Mary stands on in the original statue of Fatima) seemed like a match made in heaven. Back in the early nineteen hundreds, the city of Dillingham needed to calm the waves down so the harbor could be used by the many fishing vessels. Dillingham decided to build a jetty. 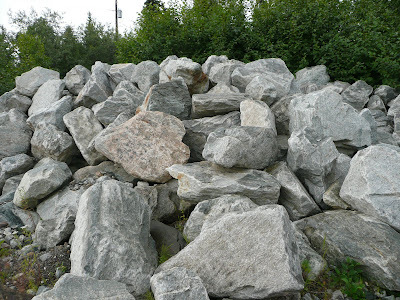 Since they needed rocks, the city of Nome, Alaska barged over thousands of tons of them, hence, Nome rocks. Dillingham used these rocks and had quite a few left over. An anonymous Dillinghammer ended up purchasing them and he donated one to Holy Rosary. 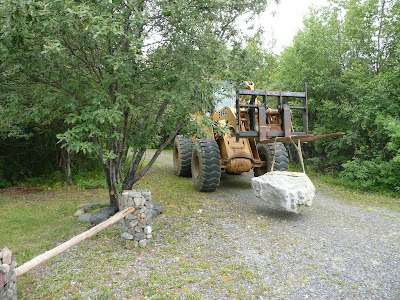 Moving a 2120-pound rock in Dillingham, Alaska is not an easy feat. Thankfully, several generous people have donated their time, talent, and money to make it all possible. 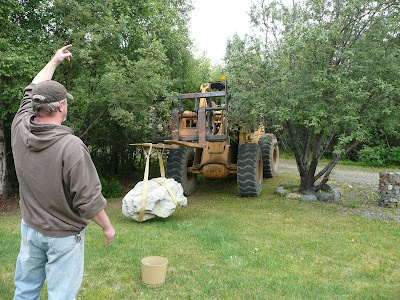 Here are a few people who were involved: One anonymous donor not only gave us the rock but pulled it out of the pile and prepared it to be picked up; Bobbie, Nora H., and Angela C. were needed as consultants to find out a good spot to locate the huge one ton Nome rock; Jimbo and Warren moved the rock about 10 miles north of Dillingham to Holy Rosary and then positioned it on the lawn. The statue still has to be attached to the rock. Thomas Clark and I set it on top of the rock just to get some pictures. 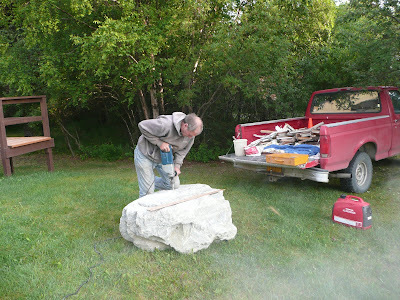 To attach the rock permanently, we have to drill a hole in the rock, insert some re-bar in the rock with enough poking out to fit in the hole drilled in the bottom of the statue. Tricky stuff! This should be completed in a week or so. 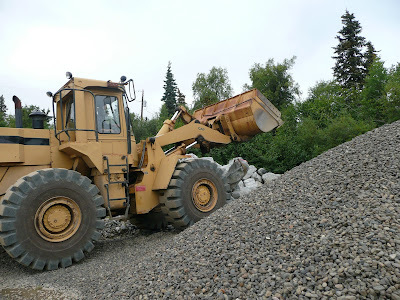 Here is the pile of rocks that THE ROCK was chosen from. Several pictures follow. If you want to make them larger, please click on them. Next, a chain was wrapped around it and then pulled out of the pile. 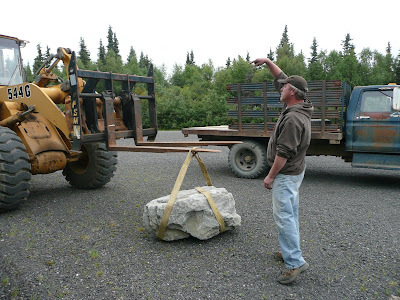 The loader carried the Nome rock over to the truck and gently rested it on the flatbed. The Nome rock was then weighed. It weighs 2, 120 pounds. 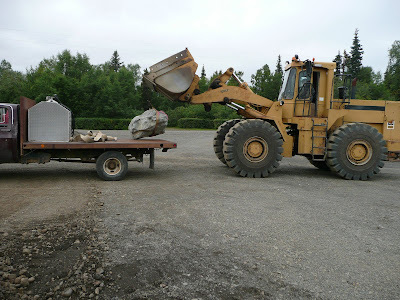 Jimbo and Warren loaded up the Nome rock and hauled it to Holy Rosary. The two then postitioned the straps on the rock and Warren, with Jimbo directing, drove the forks of the lift through the straps. 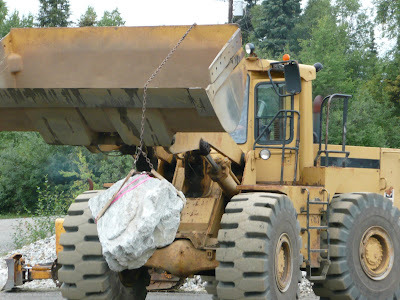 The rock was then hoisted up and taken to the lawn. 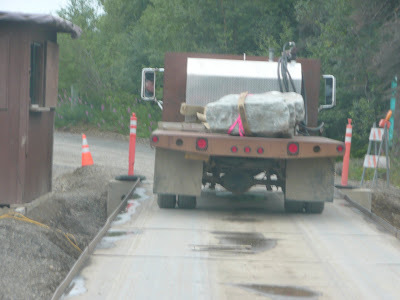 The fork lift backed down the narrow road that leads to our cemetery. As Warren weaves the huge machinery through the trees, Jimbo directs him to the drop off zone. 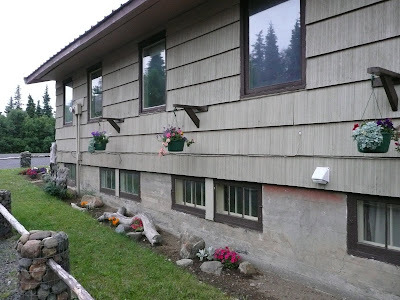 The flower pot marks the middle of the lawn where the rock will rest. A job well Done. 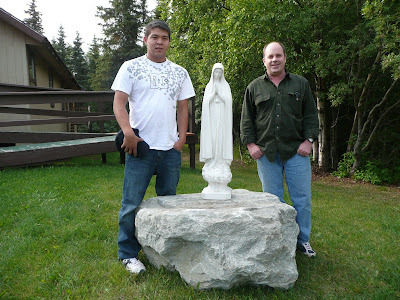 Warren (left) and Jimbo (right) pose for a shot after donating their time and talent to our Catholic Church. 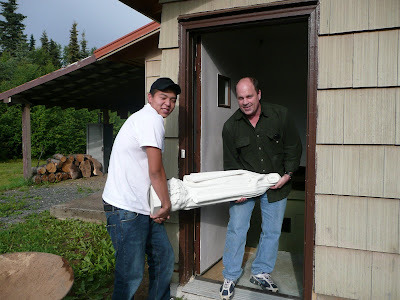 Thomas Clark and I carry the statue out of the rectory. We want to place it on the rock to see what it will look like. We can't wait to see it. The final product is within our grasp! We load it into a wheel barrow and carefully roll it over to the church lawn. I struggle to position the 140 pound statue on the huge rock. It looks perfect, very peaceful. Angela Clark said, "I can't even imagine it not being there now. It is like it has always been there." Angela Clark and her son Thomas pose for a picture in front of our new monument. Thomas Clark and I pose for a picture. Before we carry the statue back into the rectory to await its permenant attachement and blessing ceremony. Attachment Step 1: Early the next morning before his day time job, Henry S. stops by Holy Rosary to drill a hole in the rock with his specialized drill. This is the first of several steps needed to attach the statue permanently to the rock. Henry was instrumental in building the church back in the 1980’s. His commitment to Holy Rosary has been a blessing to us all! Attachment Step 2: That afternoon Pat D. drops by after he has lunch at the Senior Center. 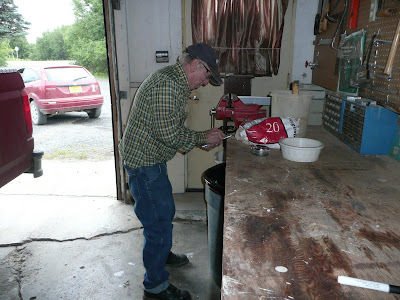 He measures the depth of the hole in the rock and the one in the statue and buys a heavy metal bolt. He then cuts it off and files it. The bolt will be inserted in the rock and statue and cemented. Pat is one of those guys everyone needs around the church. 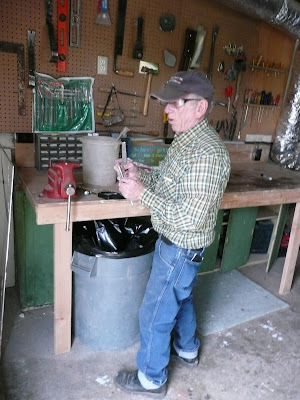 He has helped me with every project I have undertaken, from building porches to renovating the rectory to mowing the lawn. He basically puts the church first above all other things in his life. His is an inspiration to us all! 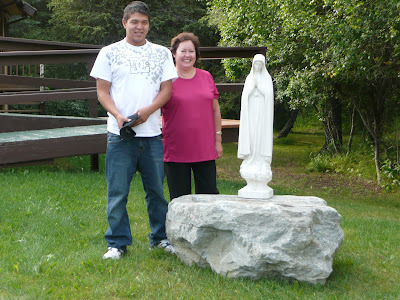 For more about the statue blessing and some information about praying the rosary, please see Angela Clark's story below. 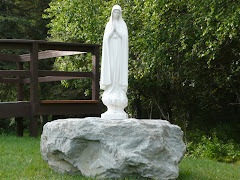 The Blessing of our Lady of the Rosary of Fatima statue will be at Holy Rosary Catholic Church at Airport Road and Emperor Way on Sunday, September 28th after Mass at 1:30 p.m. The public is (always) invited and welcome to attend. Refreshments and snacks will be served following the Blessing. 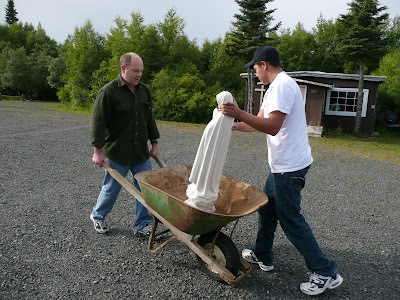 The beautiful hand carved marble statue of the Blessed Virgin Mary was made in Italy and will be installed onto a large Nome, Alaska rock at the entrance of Holy Rosary Church. Holy Rosary Church is named after the Holy Rosary. Our Lady of the Holy Rosary of Fatima statue has a rosary around the Blessed Virgin Mary's neck. This is a replica of how Mary appeared to 3 children in Fatima, Portugal in 1917 where the Blessed Mother, Mary taught the importance of recitation of the rosary to the 3 children to share with the world. The Blessed Virgin Mary's, Miracle of the Sun at Fatima, Portugal was witnessed by more than 70,000 people in and near Fatima on October 13, 1917. The Rosary is an ancient series of scriptural prayers based on meditations of scriptures, called Mysteries. The "Joyful Mysteries" are scriptures which reflect on Christ's birth. The "Glorious Mysteries" reflect on His resurrection, and the "Sorrowful Mysteries" reflect on his passion and death. 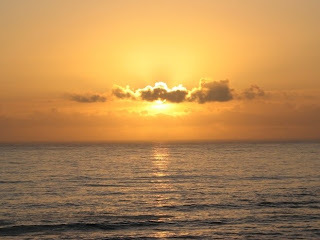 The "Mysteries of Light" reflect on Christ's public ministry, and were added by Pope John Paul II in 2003 in order to more fully enter the life of Christ through the rosary. 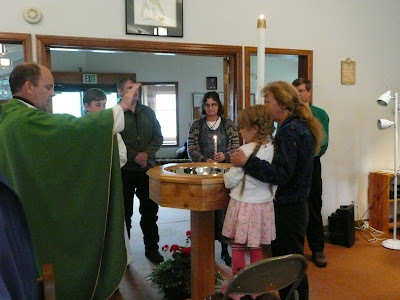 Holy Rosary parishoners pray the rosary together after Mass one Sunday of each month. The other day I was thinking about how to get out of weeding the flowerbed. To me, weeding is about as bad as sweeping the floor, but I think weeding has to be, by far, the worst. Weeding is tedious and takes patience. I had finally decided to take a few hours and just get it over with. I got up bright and early and walked out to begin. Surprise! During the night the weeding fairies had come by. 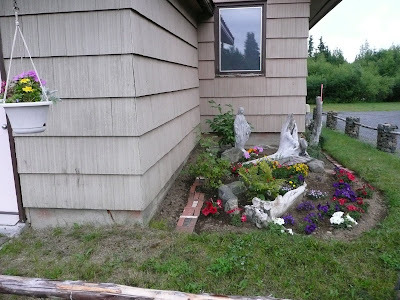 My flowerbeds were completely weeded. 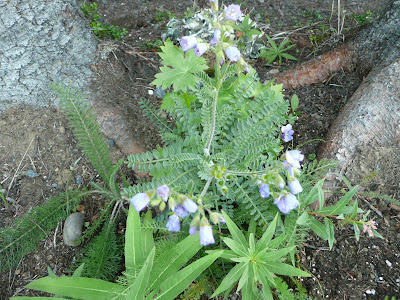 It was such a thorough job of weeding that the first person that came to mind was Nora, at the Cracker Box. 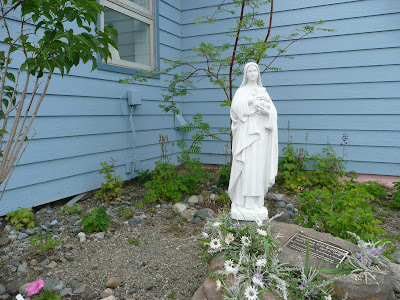 She has donated much of her time and talent to beautifying Holy Rosary. I went by to visit her and said, “Nora, do you know who weeded my flower beds?” She didn’t have to say a word, I knew right off from her radiant smile. She also told me that Janice W. was her accomplice. 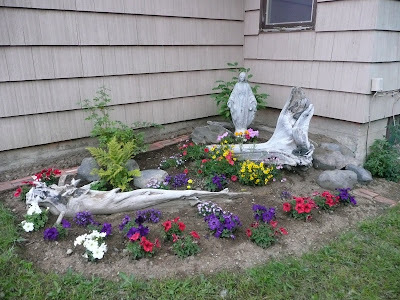 Several parishioners at Holy Rosary have taken an interest in making the grounds beautiful. Each took a section. 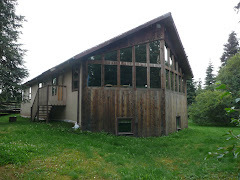 Nora J. took the New Church (top of the picture); Jane B. opted for the old church (small white roofed building on the right); Nora H, Janice, and Angela took the Rectory (red roofed building on the bottom). Each week during the summer, Karen B. brings a small vase of freshly cut flowers to put at the foot of the statue Mary inside the church. It adds a breath of fresh air to our Mass. The result is an assortment of colorful flowers of all shapes and sizes. 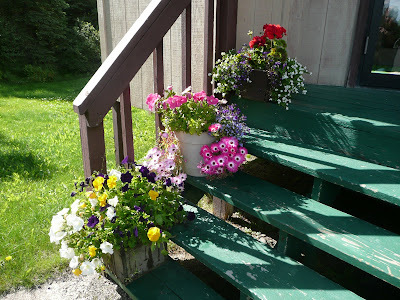 When people drive up to get water, go to Mass, or just visit, they get a wonderful feeling when viewing the beauty that has come from the flowers. God’s hand is truly at work here. Click on Pictures to make larger! Nora J. and Kenzie pose in front of the flowers on the steps of the Church. Nora has been providing these flowers for years. 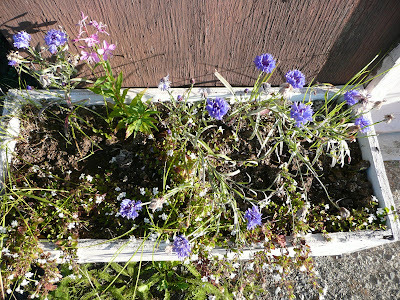 Jayne planted perennials and bachelor buttons around the old church. She got off to a slow start this year because of my huge mistake. I dug up all her perennials from last year.. Just after the snow melted I went around weeding and forgot she had planted them the year before…live and learn. 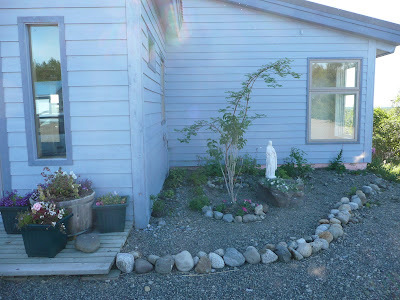 The three Hanging plants around the rectory are compliments of Nora H.
Flowers surrounding the stature of Mary. 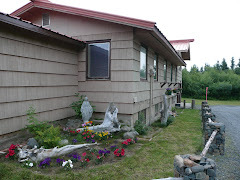 The statue and flowers are located outside the rectory so that the people in the Dillingham community who come for drinking water will see it. Holy Rosary has the best drinking water in town and people line up to get it. Flowers by Angela, Nora H, and Janice. 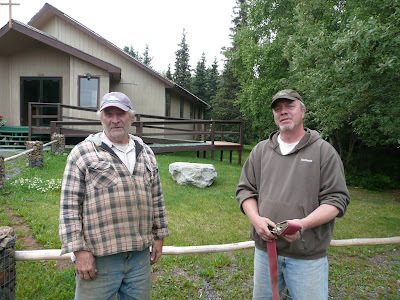 To be baptized out in the Alaskan Bush is not “business as usual.” Preparation and prayer have to work together. For work, many people travel by air to other villages. 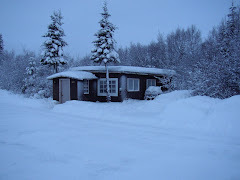 The weather is very unpredictable and air travelers can be trapped in other villages for days on end. A couple days before the baptism would take place, Katelynn’s father, Michael, had to visit a village to do some work for the Forest Service. His plane was delayed several times due to mist, wind, and fog. 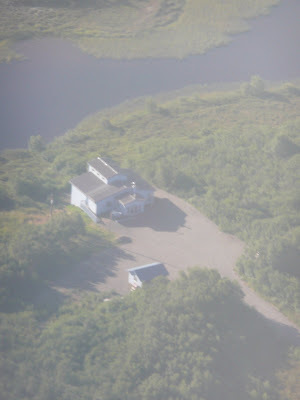 Patrick, a Godparent, was also flying around away from Dillingham on business for the Fish and Game Department. 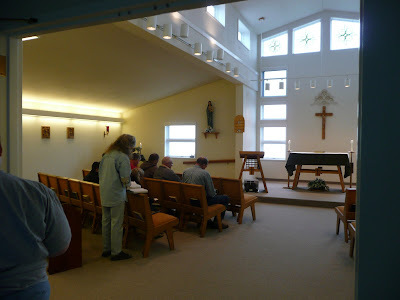 I was at Saint Theresa in King Salmon/Naknek celebrating Mass at 9:00 AM the Sunday morning of the baptism. 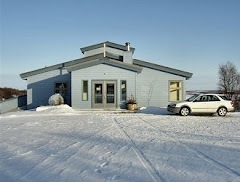 I needed to fly 64 miles back to Holy Rosary in Dillingham to set up the church for the 12:30 service. 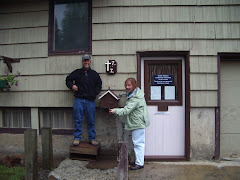 A week before the Baptism, we made a back-up plan, which is standard operating procedure in this remote area. 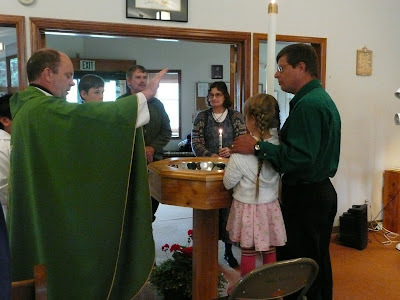 We planned to have the baptism a week in October if one of us could not make it back to Holy Rosary. I prayed all week for good weather. An hour before the Mass and Baptism was to begin we started calling each other to see if everyone was present. We were…a miracle. 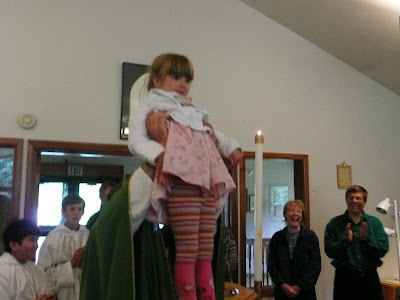 We also had a small potluck/reception planned for Katelynn after Mass. It all came together nicely. 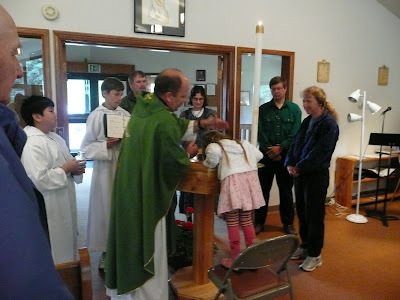 There were over 50 Catholics in attendance for the Mass and Baptism on August 17, 2008 at 12:30 PM. (Please click on pictures to make them larger). Katelynn being Baptized. Patrick and Aileen the Godparents are standing in the back. The two altar servers are Brian and Anthony. 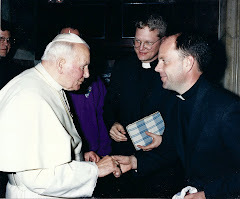 Father Kelly Story by Father LeRoy E. Clementich C.S.C. 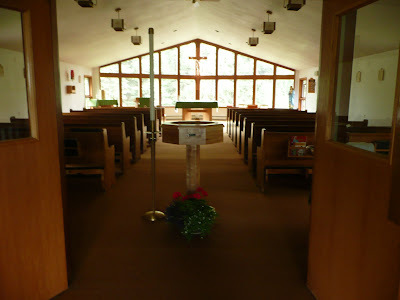 Saint Theresa is a Mission church of Holy Rosary parish. 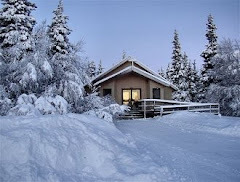 It is located 64 air miles South East of Dillingham and about 290 air miles South West of Anchorage. 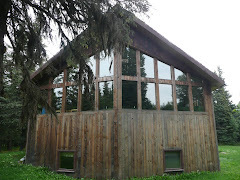 It sits on the Naknek River near Katmai National Park. 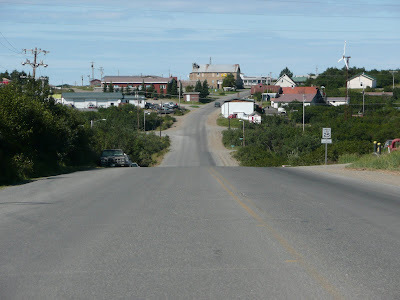 Saint Theresa is actually located in Naknek, but in reality it is half way between King Salmon and Naknek. 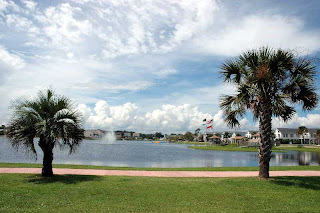 There is one twelve mile paved road separating the two small villages. Saint Theresa sits right smack in the middle. 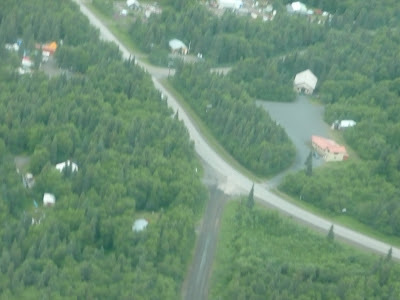 From Saint Theresa it is approximately six miles to either village. The population of King Salmon is about 500, as is Naknek. Together, the two villages account for a total of about 20 Catholic Families. 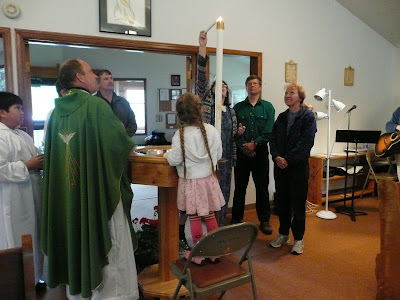 The following are some pictures that will help to further your introduction to Saint Theresa Parish. Click on the picture to make it larger. At the end of the pictures is a story just sent to me by Fr. Clem about the death of Fr. James Kelly. It is a very good story and well written. 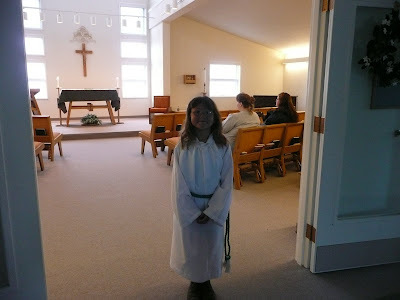 Kierra before altar serving for Mass August 10 at Saint Theresa. A memorial for Joanne Bradford whose generosity enabled the Saint Theresa community to build the church building. The Bradfords, who own a bar in Naknek, have given Saint Theresa a yearly percentage from their gaming fund. Some of the money will also be used to pay for a new engine, propeller, and new paint for the Cherokee Warrior II I fly to the villages. The beautiful statue of Saint Theresa came from Rome. Joanne's ashes are inside the memorial. After Mass August 10, 2008, Mary logs in the collection while her daughter Jennifer helps out. 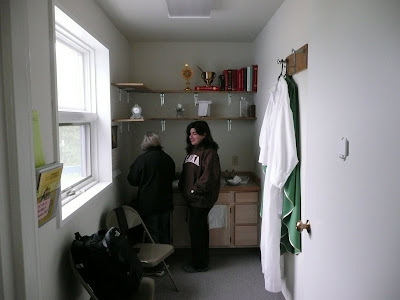 Both Mary and Jennifer are very dedicated and active parishioners of Saint Theresa. 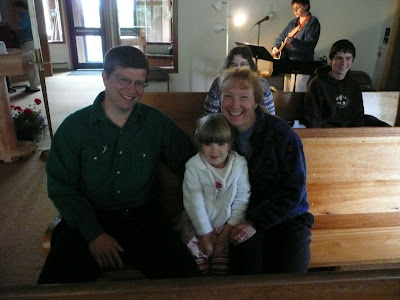 The multi-talented fourteen year old Jennifer altar serves, plays the guitar, sings, and is a lector. 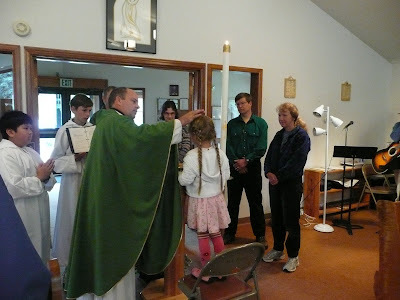 Before Mass August 10th, Barbara (BJ) Hill looks up music and signs in lectors. Several fishermen are in the front row awaiting the Mass to begin. 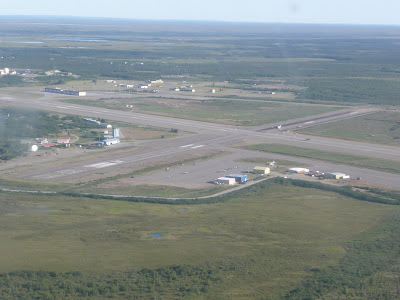 Before landing in King Salmon, I snap a picture of Saint Theresa from the air. Airport at King Salmon. Runway 360, the smaller runway, is where I aborted my take off a few weeks ago because I did not have enough power to lift off. Larry ordered a new engine around the 5th of August, 2008. Here is a picture of Naknek, Alaska in August. Fr more pictures and info about Saint Theresa, CLICK HERE. 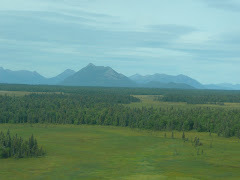 Actually, it was lousy day for flying in western Alaska on that weekend of March 23, 2002. For Catholics, it also happened to be the weekend of Palm Sunday and the beginning of Holy Week. The young pilots who fly the Piper Saratoga’s for Pen Air in Dillingham were sitting around the cargo hanger, playing cards, waiting for the weather to clear. Kelley zips up his down jacket and heads for the plane, brushes the snow off the wings, puts on his mittens, piles into the airplane and heads out. By then, it was already early evening, and the weather was not getting any better. By morning’s light, everybody knew that something had gone wrong. Kelley never got to Togiak. After the weather finally lifted, search pilots from Pen Air and other local pilots flew out over the mountains west of Dillingham to check out the situation. The search did not take long: Up on the top of Tukalung, lay a crumpled-up, green and white PA 28-181, Kelly’s plane, the Dakota. No sign of life. It took nearly until noon until they finally got a chopper up there to bring the body home. The news of Kelley’s death hit Bristol Bay and western Alaska pretty hard. 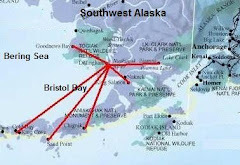 Kelley was the pastor of some 25 or so little villages from Dillingham to Naknek to King Salmon and all the way out the chain to Dutch Harbor. He occasionally would boast that he was pastor of the largest parish in the world with over 139,000 square miles of territory. He was one gutsy guy, Kelley. Weather never seemed to bother him much: With his twin Cessna, for instance, he’d fly the 500 mile, one-way trip to Dutch in weather even the “professional guys” wouldn’t touch. “God is my co-pilot”, he’d say. Hmmm! 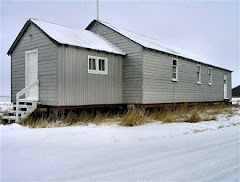 Of course, there were also other villages closer in, like Chignik Bay, Perryville, Nelson Lagoon, Sand Point and Cold Bay and others that he could easily reach with his Cherokee, the Dakota. For Dutch, of course, he always used the twin. Father Jim Kelley was both a dedicated pastor and a superb pilot. He learned how to fly as a kid in New Bedford, Massachusetts. After he was ordained, he joined the Navy and served as a chaplain, retiring with the rank of Captain. 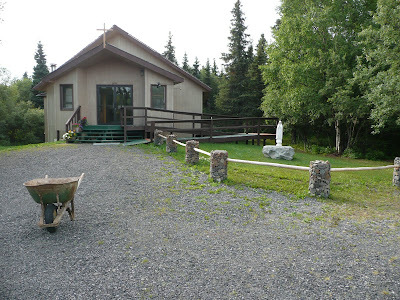 Always on the hunt for new pastoral and flying challenges, he came to the Archdiocese of Anchorage and began serving the Church in the bush, the dozens of those little villages out on the Aleutian Chain. 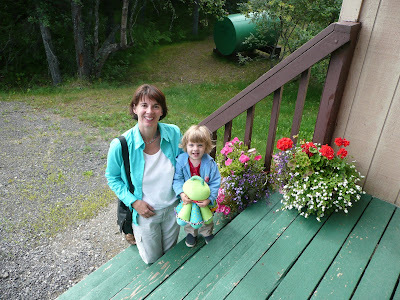 Stories still abound, describing his dedication to these western-Alaska outposts. He would regularly fly into one small village, for instance, where only a single Catholic lived. On many occasions, when weather was threatening, he would radio ahead to a contact person in the village and say: “Father Kelley here folks, I’m ten minutes out. 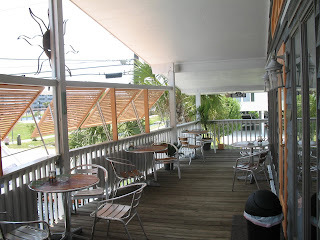 Weather’s not looking good; be out on the end of the strip and we’ll have a communion service on the wing of the Cherokee. And so it was. 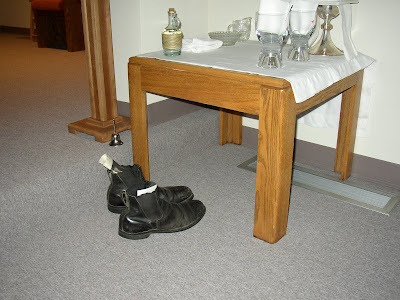 Kelley would come in, do a 360, land and hand his Mass kit out to the closest person, get out and spread a white corporal on the wing and begin: “Our Father, Hail Mary, Glory be…This is the Lamb of God who takes away the sins of the world. Happy are those who are called to His supper…. The Body of Christ” “Amen.” Then there’d be a short thanksgiving; a hug all around and Kelley would head out for the next village just ahead of the weather. As I reflect on it, my intuition tells me that even after six years have gone by, a certain sacredness, a grace, still clings to that rocky crest over which a dedicated priest-pilot tried to fly so that some Catholic folks in Togiak could celebrate Palm Sunday. What exactly does a priest do on vacation? Having dinner with movie stars, swimming in the ocean, creating web sites, watching the newly digitalized Top Gun, eating shrimp, getting back in touch with the person who converted me to Catholicism, and yes, attending church. 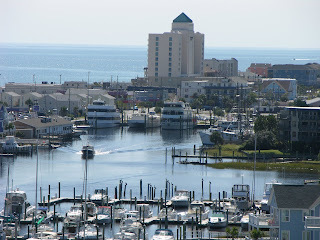 Carolina Beach in North Carolina is a great place to take a vacation. 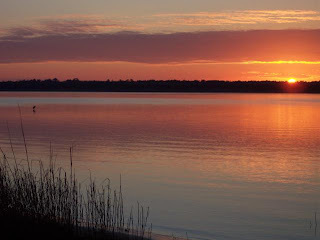 The guy who invited me to the Catholic Church, which subsequently led to my conversion from Mormonism to Catholicism, has created a web site about Carolina Beach. 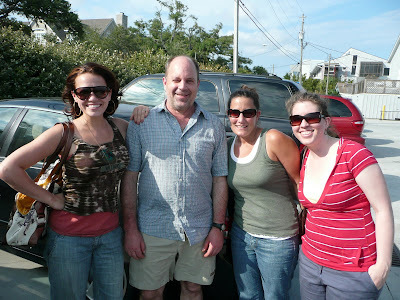 Eric, who literally saved my spiritual life, and his wife Dawn hosted me for eight days. One of the highlights of the trip was meeting, and yes, having dinner with, the movie star Joy Galeotti or CLICK HERE. After talking with her, mostly she wanted questions answered about the Catholic Church, I found her to be very religious and a great Christian. After dinner, Eric and Dawn brought me back to their beatiful new home and we watched a couple of her movies, “Bring it On (Again) and an episode of One Tree Hill. Swimming in the ocean was something I have not done for ever! Eric and Dawn live within walking distance of Carolina Beach…big waves and warm water. It was great fun kidding about sharks that could potentially, well, eat us. As Eric and I were walking back to the shore line, we were blind sided by one huge wave that mowed us over. Yikes. Eric had purchased a huge surround sound unit that literally has the sound and vibration of a sixteen year old rapper’s CD player stopped at a red light. Hearing those tomcats in Top Gun was a memorable event. 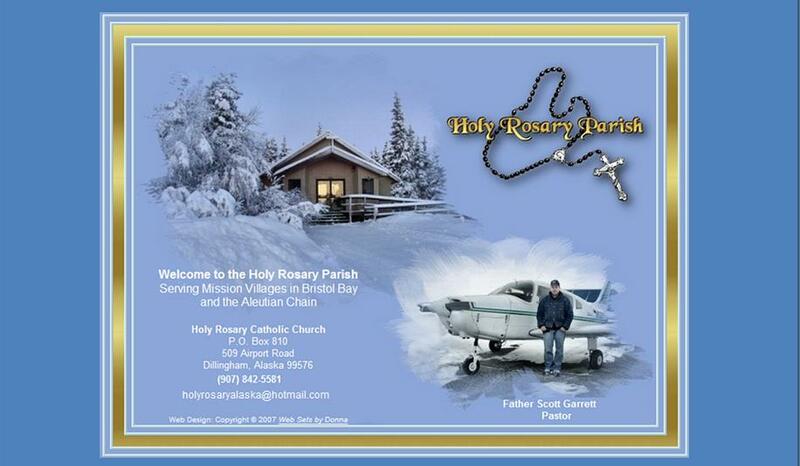 Also, the two blog masters, Eric and Dawn, helped me create a web page (the one you are looking at), made me my first business cards, and created a Holy Rosary Logo and letterhead.